World rapid champion Viswanathan Anand outclassed Gawain Jones of England and moved to fifth spot after the end of the 10th round of Tata Steel Masters in Wijk Aan Zee, The Netherlands. With his third victory in the event, Anand came back within striking distance of the leaders. His tally of six points out of ten is only one point less than Holland's Anish Giri, Norway's Magnus Carlsen and Azerbaijan's Shakhriyar Mamedyarov, who all have seven points apiece. With three rounds still remaining in what is called the Wimbledon of chess, Anand will have his task cut out in the next round after the final rest day. He will look forward to bridge the gap further as he plays white against tail-ender Yifan Hou of China. The victory against Jones was especially important as it came with black pieces. The English Grandmaster chose the Alapin variation to counter Anand's Sicilian defense but did not continue adequately in the ensuing middle game. It was on the 16th move that Jones erred by pushing his queen pawn. Anand was quick to pounce on an idea that involved sacrificing his rook for a bishop and that gave strong compensation. Picking up a couple of pawns soon after trading the queens Anand was at his technical best as his pieces created havoc. The game lasted 40 moves. On a day that saw Anish Giri taking a solid draw as white against Sergey Karjakin of Russia, almost everyone in pursuit got ready to catch him. Carlsen scored a fine victory in the endgame over Wesley So of United States, Mamedyarov played attacking chess to outwit Peter Svidler of Russia and Vladimir Kramnik of Russia jumped to sole fourth quashing the challenge of compatriot Maxim Matlakov. Grandmaster B Adhiban's hunt for an elusive victory did not end though. The Indian played out a draw with Yifan Hou to remain 13th in the 14-players event. In the challengers section India's Vidit Gujrathi remained on course for his first victory in the maiden attempt and join the Masters section next year. 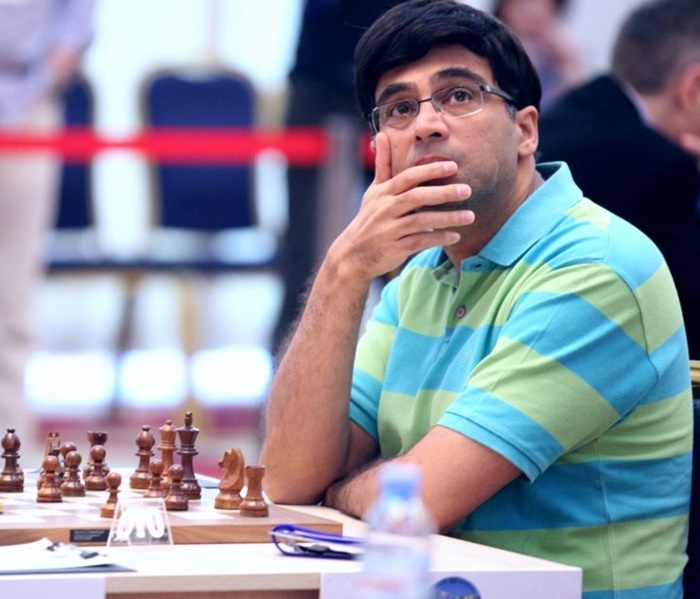 Gujrathi played out a draw with Jeffery Xiong of United States and matched co-leader Anton Korobov of Ukraine on seven points after the latter split the point with Erwin L'Ami of Holland. It will be a show-down between Gujrathi and Korobov in the next round and the Indian will have the advantage of playing white. While a victory will almost certainly seal the top place for Gujrathi, a draw will keep him pretty much in contention too. Results round 10 Masters: Gawain Jones (Eng, 4) lost to Viswanathan Anand (Ind, 6); Anish Giri (7) drew with Sergey Karjakin (Rus, 5.5); Peter Svidler (Rus, 4.5) lost to Shakhriyar Mamedyarov (Aze, 7); Vladimir Kramnik (Rus, 6.5) beat Maxim Matlakov (Rus, 4); Wei Yi (Chn, 4) drew with Fabiano Caruana (USA, 3.5); Magnus Carlsen (Nor, 7) beat Wesley So (Usa, 5.5); Yifan Hou (Chn, 2) drew with B Adhiban (Ind, 3). Challengers: Jeffery Xiong (USA, 5) drew with Vidit Gujrathi (7); Anton Korobov (Ukr, 7) drew with Erwin L但mi (Ned, 4.5); Matthias Bluebaum (Ger, 5.5) beat Lucas van Foreest (Ned, 4); Jorden van Foreest (Ned, 5.5) drew with Bassem Amin (Egy, 5.5); Benjamin Bok (4.5) lost to Dmitry Gordievsky (Rus, 5.5); Olga Girya (Rus, 3) drew with D Harika (Ind, 4); Aryan Tari (Nor, 4.5) drew with Michal Krasenkow (Pol, 4.5).